I don’t know what it is about the Super Jackpot Party slot machine, but every time I walk past it I just want to dance. I don’t really, I just made that up, but I am sure that the maker of this video slot – WMS, would love to think I did. One thing you can say about Super Jackpot Party, you cannot miss it if it’s in the casino. There are jingles, song snippets and random noises constantly being pumped out of this machine. It is also so bright in color that it you are advised not to stare at it for too long. 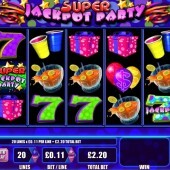 WMS have released an online version of Super Jackpot Party, which is just as loud and bright as the slot machine. There are a few changes in the game, but it is hardly noticeable. As far as I am concerned the online version is pretty much an identical clone of game you would find in a casino. 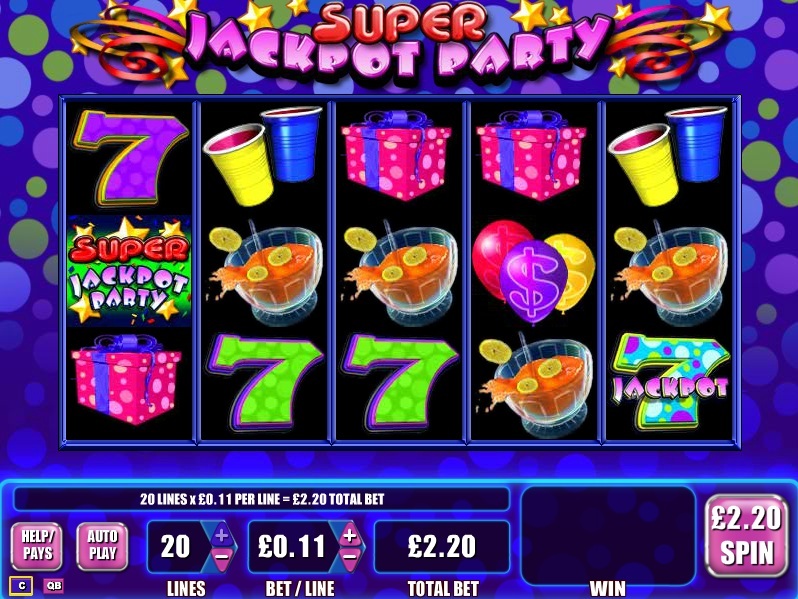 It's all about the 'Party' in Super Jackpot Party, so the symbols feature party cups, party punch, balloons, presents and disco balls. The number 7 features throughout the reels and the big wins come in when you land the jackpot 7's on a single payline across the reels. The layout of Super Jackpot Party is pretty much standard, with 20 payline over 5 reels on 3 rows. The bonus round in Super Jackpot Party is a pick ‘em style bonus and is activated when you get scatters on reels 1, 3 and 5. There are two different feature symbols; the man with the party popper and the party blower, any combination of either will activate the bonus round. During the bonus you will pick boxes to reveal cash prizes. Watch out for the pooper, who will bring the bonus to an end. You only saving grace is picking a party favor to keep it going. It is fairly easy to hit the bonus and you should see it happen a few times if you sit down for a session on Super Jackpot Party. That being said, it is rare that you will be getting anything near 100x your stake with this type of bonus, but now and then it does pay out nicely. Just like IGT’s version of Wheel of Fortune, Super Jackpot Party is big, load and gives you regular payouts. The great thing about the online version is that the RTP is 96.01%, which is as much as 4-6% better than in a casino. However, if you are more of a medium or high volatility slots player then I imagine you will start to lose interest in Super Jackpot Party after a while. If you do prefer the excitement of high volatility slots then you may prefer something like the rock band-themed Kiss slot or the German-inspired Bierhaus slot game, both of which are available online.